Trailers still go a long way toward marketing a movie, even in today's market filled with internet spoilers and leaked scripts and such. There's no getting around the need for a trailer to help sell a movie to potential audiences. And as smart as we think we are or how advanced our critical theories can be when it comes to film, a really good trailer can still hook us in to watch just about any movie, really. This was the case with After the Dark, at least for me and Tobie. The trailer alone got us really excited about this movie and we invested a fair amount of time in securing a copy for ourselves. And as much as we did our best to manage our expectations, it's hard to deny that the trailer had gotten us pretty excited about watching this movie once given the chance. And while the core premise was really powerful and things started out well enough but it somewhat underwhelmed in terms of final execution. And the ending, well, it just wasn't good at all. 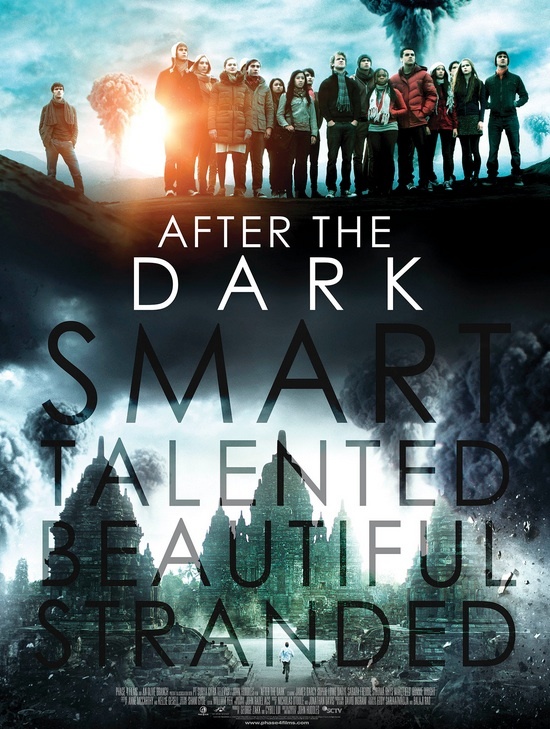 Synopsis: After the Dark is sort of a psychological thriller but really with some serious philosophical undertones. It's often tagged as a science fiction movie but I don't see how that was a central element. It was written and directed by John Huddles and was originally called "The Philosophers." At an international school in Jakarta, we are introduced to Mr. Zimit (James D'Arcy) who handles his philosophy class in a somewhat alternative way. The key focus of his classes were his rather in-depth thought experiments where he has his students try to navigate through some moral dilemma primarily using logic. And with this being the last school day, the students were expecting a bit of a break. But Mr. Zimit doesn't let them off easy and offers them one last thought experiment. The students are all given cards that indicate a job or role in society that each student is to have. The class is facing worldwide annihilation as the world is engulfed in some sort of atomic apocalypse. There is a bunker that can keep them safe for a year, but it's only designed to support 10 people, which is less than half the class. Then they must plead the case of their specific role in order to determine who will be saved. Once the survivors have been selected, they continue to discuss what will happen to them in the one year when they could finally emerge from the bunker. The movie does a pretty dramatic job of setting up the whole "thought experiment" complete with special effects mushroom clouds exploding in the distance and all that good stuff. This is probably the reason why the movie is often tagged as a science fiction piece when I never really felt that science-related fiction ever played a large in the narrative. Sure, you could say that imaging a nuclear apocalypse was probably related to most other science fiction stories, but that really wasn't the point of things. The apocalypse aspect was merely part of the thought exercise and thus it's really just a tool to discuss / illustrate / demonstrate the various philosophical arguments. Things were pretty thought-provoking at first as the movie practically orients itself towards the audience as we evaluate the role of each person and their relative value to the future of the human race. And the class actually gets to go through the exercise more than once with other changes to the variables in order to make the decision-making process harder. Those were pretty clever ideas and the sort of thing that reminds me of my university days. There was a definite attempt to have the various students represent different views, voices and philosophical perspective. And yet we don't know quite everything that's in play in these various scenarios. A lot of the movie centers around Petra (Sophie Lowe), with her supposedly being the best student in class, and her in-class boyfriend James (Rhys Wakefield). The relationship is one that still carries over into the various thought exercise scenes, which are presented as fully realized scenes showing their actions within the world on the brink of ruin. Petra is supposed to be all virtuous yet also intelligent while her boyfriend isn't quite up to snuff at times. Then you have Mr. Zimit being rather scarily intense in terms of his in-experiment representation with decisions that don't seem all that logical. In the end it stops being a philosophical thought exercise and it just sort of degenerates into nearly random images and a "solution" to the problem which was less logical and a lot more warm and fuzzy. And the final reveal at the very end wasn't that big a surprise, but the decision to go down that route really just cheapened things further. This movie needed a better ending. For the most part, After the Dark had a great idea to start with but then the final follow-through just wasn't there. Acting was a little neutral, but I suppose that's to be expected from a predominantly young cast with a fairly creepy teacher leading the whole group. The movie gets 3.5 harsh decisions condemning one or more of the students out of a possible 5.